The FOOT, TURF TOE, and other Elephants. Thanks to Kevin Kolb of the Cardinals, Turf Toe has been on the brain and in the Press. So it’s time for my take on the foot and Turf Toe. After researching it, Googling it, looking up medical reviews and articles, I saw a missing piece of the puzzle. The typical treatments of resting, icing, taping, modalities, range of motion, soft tissue work and all that have their place and certainly help to treat the symptoms. I don’t want to go there, the info is readily availble and, well, rather boring. A lot of the articles addressed possibles mechanism of injury and the HOW. However, one element that was missing that seemed to be screaming for clarification was the question, “WHY.” To me it’s the elephant in the room. For the athletes with Turf Toe, Foot, or other Chronic problems, here’s the quick take: If you have a knee injury that is slow healing, if you have a hamstring that heeps getting re-tweaked, if you have a chronic ankle injury, then the problem could be your FOOT. It’s getting overlooked. I’ve worked with so many athletes with chronic problems that had a biomechanically messed up foot that wasn’t being addressed. It’s a piece of the puzzle that can stay hidden if not looked for. Just treating the toe via taping, rest, exercise, etc, is NOT enough and does not address the CAUSES. A certain foot type can play into the big toe (and chronic ankle sprains, knee injuries, hamstring strains, etc) getting chewed up and undergo additional stress causing further injury. A biomechanical assessment will determine the causes and determine a 3D plan to address the causes and the compensations. Not your typical HAMSTRING. An unconventional approach. A missing link. Wow. I just looked over the NFL Injury List again this morning and at the top of the list was the Hamstring, with the knee right next to it. After years of working with athletes, teaching courses and working in clinics, the hamstring is what started me on the path of getting away from conventional therapy and training. This is just a “pre-post” of an extensive HAMSTRING VIDEO I will be doing shortly. If you’re a pro dealing with a hamstring problem, I just want to throw out some questions to get you asking, “Why am I doing these exercises, is it working? Athlete on his back with a trainer cranking his leg as far back as it can go to stretch the hamstring. What does the hamstring do? What does the hamstring do when an athlete is running down the field or court? Manning: Attacking the Neck from the Bottom Up. A Football approach. What is taking so long for Manning to get back? His neck surgery was on May 23, which puts him 13 weeks out since his surgery. 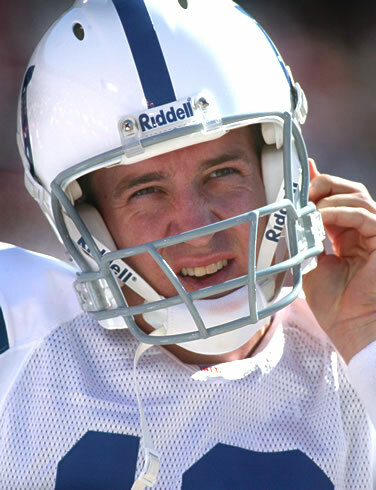 According to an article in ESPN on May 25th, “Manning told The Indianapolis Star on Tuesday that the procedure was ‘minimally invasive’ and said he expects to make ‘a quick recovery.’” ¹ Is he still in pain? Does he not have full motion or function back in his neck at more than 12 weeks out? What’s the hold up? OK, so the first one with the lady that is about to be hung, is a bit of a stretch. But, not really. Traction as a treatment for disc injuries may have it’s place. Yet, it is limited in what it can do for a QB that has to take big hits and deal with gravity and increased G’s (not decreased) due to the nature of the position. I don’t know if Manning had traction or not and it may feel good while he was on it, but it will not help him deal with the torque of the throw or the force of impact of a hit. The ROM blue pick is just typical therapy exercises for a neck. Typical, boring, and irrelevant for specificity of the QB position. This is completely non-functional and does not prepare the neck to react to the demands of the sport. It is TOP-DOWN. The QB needs a BOTTOM-UP approach. We’ll get there in a minute. Tiger Woods Video: Getting to the CAUSE of his injuries. Traditional methods may not cut it. Why does Tiger keep getting injured? Will he make it back to the top? Why does his Achilles get chewed up? A biomechanical analysis to determine the potential CAUSES of his injuries. Throwing Injuries: It’s not the shoulder’s fault, it’s not the elbow’s “fart”….. I was speaking at a sports symposium and I must have been more nervous than usual. Maybe because it was a different crowd than who I usually speak to (they were sports med docs and orthopedic surgeons instead of strength coaches and trainers), or maybe because it was the chick on the front row that kept giving me mean looks (I was presenting a different viewpoint than traditional rehab and I don’t think she liked it). Anyway, I was discussing how conventional rehab places all of it’s emphasis on the shoulder and elbow without an attempt to look at the biomechanics that leads to injuries. Then I said it. What a colossal mistake…..”It’s not the shoulder’s fault, It’s not the elbow’s ‘fart’……” Fart instead of fault. Just off the chain man. But at least it got the crowd going and I had nothing to lose after that point. If you have a shoulder or elbow injury, have had one, or are just doing the “pre-hab” exercises to prevent one, I want to show you a different approach, a better approach, a biomechanical approach, and simply, a throwing approach. Here are a few pics of thrower rehab exercises that spurred me to talk about the shoulder and elbow. When I see this, it just pushes my buttons and I just can’t stand the thought of a pro athlete, or even a little leaguer, doing this stuff. Warning: DO NOT DO THESE! Oblique Strains and the MLB Injury List. Close but not quite…..
Do you have an OBLIQUE strain and it’s slow to heal or keeps coming back? Why current trends are close but not quite enough…..
I’ve been studying the MLB injury list lately and it makes me ask the question: What’s up with the Oblique strains.” I broke the injury list down categorically into number of injuries per injury site. No, it’s not a comprehensive research study or meta-analysis with a large N value with statistically significant values. It’s just a guy counting the injuries per body part and is just a snapshot of time. But….it’s still relevant and the numbers don’t just come out of a vacuum. The list is the list and I bet if you did the same count a year from now it would still show similar patterns. *This is a summation of ALL the “other” injuries such as concussions, finger, thumb, rib, neck, toe, kidney, lat, and even suspension. It is pretty much what one would expect for baseball injuries with the shoulder at the top, followed by elbow/forearm. I was surprised the obliques came out ahead of the lower extremity injuries such as the hip, hamstring, quad and it even tied with the ankle. There is a HUGE message between those lines. Oblique strains have received more press as of late because it’s kind of new and sensational. Yet, it’s not really new, there’s just more spotlight on the obliques. I want to add my own take on a component of oblique strains that has not been up to the plate yet. Actually, there have been some good articles and posts describing the oblique, it’s role in baseball, and some potential reasons for it’s occurrence (Cressey does a good job in his post http://ericcressey.com/oblique-strains-in-baseball-2011-update ). I’m so bummed about Yao resigning. I just can’t believe it. Well, not really, considering what he went through with his injuries, surgeries, rehaberies, and the like. Went to the Rocket’s website a while back and just clicked on a Yao video. It was a take of him going to visit a school and how all the little children “Ooh’d and Aah’d” over the super hero visiting their class. And of course all the media was there to highlight and capture the event. Thought it was going to be just a nice touchy feely clip….but then….boom….the reports just started hammering Yao about the next season; if we was coming back, when he was coming back, how was his foot and ankle feeling, what he was doing for rehab and practice. They would not let up. It just seemed a little out of context for the school setting. All along I was wondering, “Why couldn’t they help him? What if? What if they could have got him back? I won’t go into biomechanics on this post. I mostly want to talk about the whole scenario regarding Yao (if you want more on the biomechanics and causes for BIGS, I went into it in detail on my recent post: Bigs: Are they more prone to injury? The answer may surprise you……http://bit.ly/ko3dMi). Yao acknowledged earlier this year that injuries may force him into retirement. He has become a “global icon”, connecting the NBA to China and across Asia. In fact, China is the NBA’s second biggest market. NFL Lockout. What about the “Performance Lockout”? The strategic link that “Locks Out” a Pro’s performance. “locks out” or shuts down a pro’s skill on the field. Beyond doubt, without question, undeniably, the answer is………. the TRANSVERSE PLANE. “feeds”, the sagital plane (straight up and down movements). I want to present another option. A better option. A more objective option that is not based on assumptions, or wives tales with no statistical, musculoskeletal, or biomechanical foundation. I want to associate the “BIG” theory with the “RUNNER” theory. There is the prevailing saying out there, and I’m sure you’ve heard it, that goes, “Running is bad for you, it’s bad for your knees and wears down your joints.” If you’re a runner, hopefully this statement ticks you off and you have not bought into it. This is just illogical and I will address it in a bit. Is it true? Do “Bigs” have more injuries? When I was trained to determine if a concept is true or not, I had to apply certain criteria. 1). Is it FACTUAL? The only way to find this out in regards to injury and BIGS is stats. Injury reports and meta-analysis. I do not have all of that data at my finger tips nor do I want to take the time in this post to do the survey. However, from a cursory overview of injury reports, the BIGS do not statistically get injured more than other players. Obviously, there are many factors to consider in analyzing the data such as contact or non-contact injuries, fewer percentage of BIGS compared to other players, time of season, etc. However, statistically, I do not think it plays out.